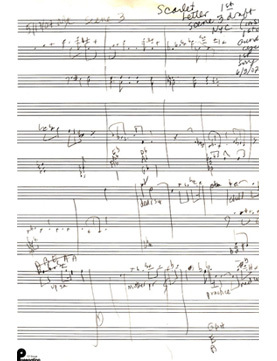 Here, the ideas for the opening of Act I, Scene 4, are scribbled on the back of an envelope. 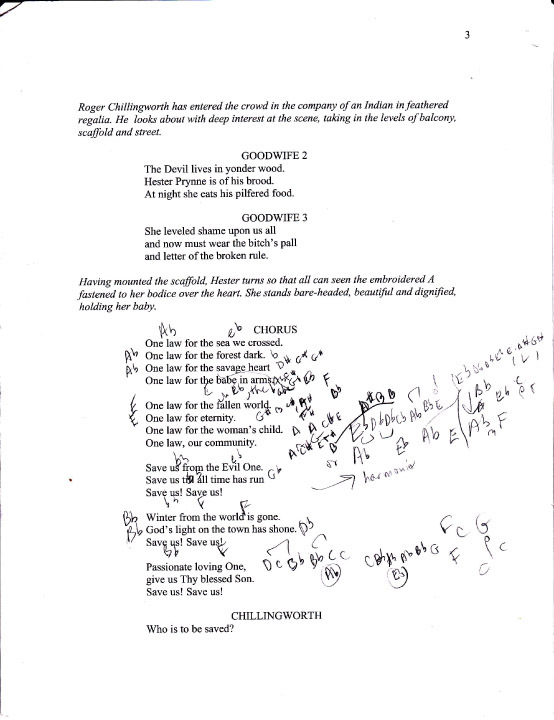 The rhythm is meant to convey a heartbeat, and the dynamic contrasts the difference between the strong (Chilingworth) and the weak (Dimmesdale). 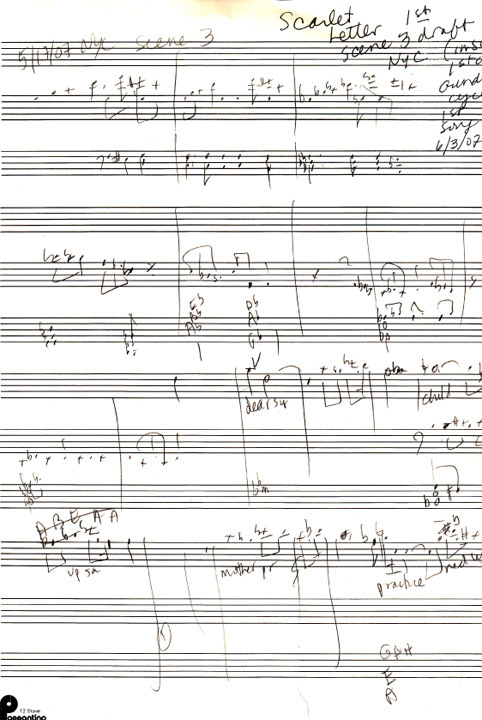 Here, the ideas for the opening of Act I, Scene 4, are scribbled on the back of an envelope. 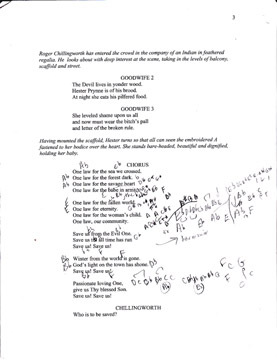 The rhythm is meant to convey a heartbeat, and the dynamic contrasts the difference between the strong (Chilingworth) and the weak (Dimmesdale). I was obviously wondering whether to construct Dimmesdale's vocal line so as to reflect his illness, or whether that revelation would be premature. I have no idea what the $110 and $150 scribbles refer to, but Jeff Sharkey and Pat O'Neill (sic) of Peabody had apparently called me! The opening draft for the beginning of Act I, Scene 3, done in my NYC apartment. 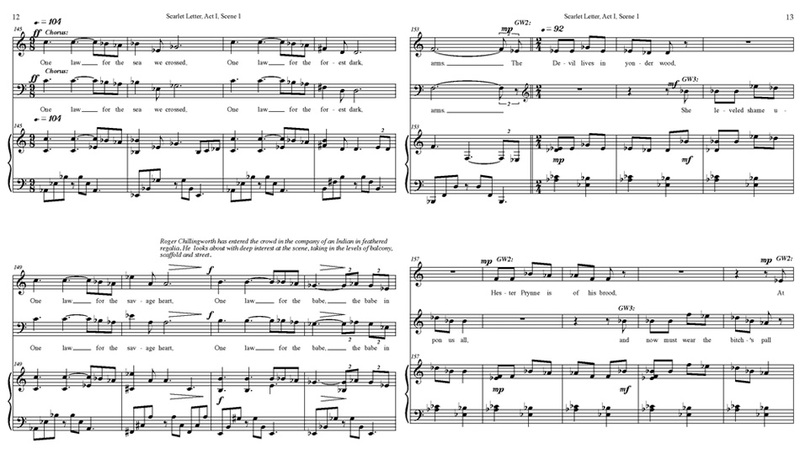 Carol Kimball must have been visiting me, as I remember singing this opening to her, and she was surprised that I would sing through my compositions as I was writing them. 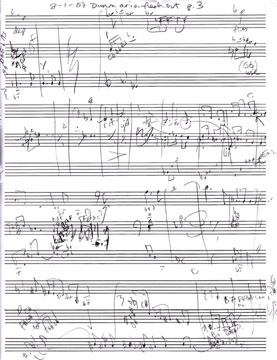 Even before getting to music paper, I had some ideas - here they are drafted on a printed copy of the libretto. 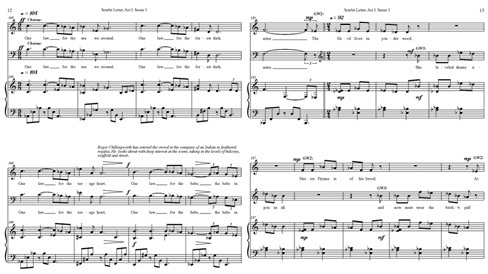 A sketch of "One Law" chorus, as it appears in the Piano-Vocal score. I wound up using many of my original ideas, and purposely constructed the melody, using the same pitch of "One" and "Law" - to further underscore their meaning. A sketch of "Our Nights," Dimmesdale's big aria in Act I, Scene 4. 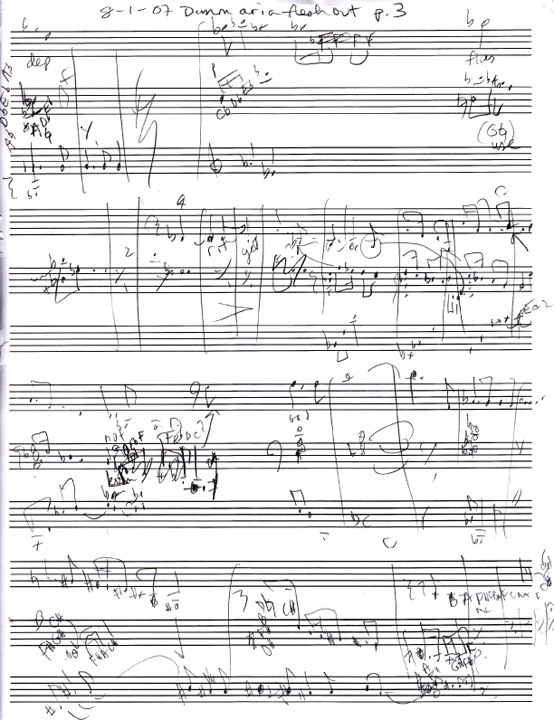 This sketch is of the end, beginning on the "depravity" - here sketched on as "dep." I often just notate a few words to indicate where I am in the vocal line. During any composition, I will often hit a "problem spot," and then spend countless hours trying to discover how best to solve it. Music paper never seems to be at hand when the solution finally presents itself. I remember scribbling this in my car, on the back of a receipt from Apex Optical. It's for Dimmesdale's aria "Ye People of New England," and I wound up using the high G (suggested in pencil) instead of the E flat, for the line "ours to share."